PUREE ALL THE INGREDIENTS FOR THE GRAVY TO A SMOOTH PASTE. RESERVE. HEAT OIL IN A LARGE DUTCH OVEN POT OVER MEDIUM HEAT. WHEN OIL IS HOT ADD MUSTARD SEEDS AND COOK 60 SECONDS UNTIL THEY SIZZLE AND RISE TO THE SURFACE. ADD CURRY LEAVES, STIR WITH A DRY SPOON AND SWITCH OFF FLAME. ALLOW CURRY LEAVES TO COOK IN THE HEAT OF THE OIL. WHEN SPICES HAVE COOLED ADD PUREED TOMATOES AND ONIONS. COOK ON A SLOW FLAME 45 MINUTES OR UNTIL REDUCED TO 1/4 ITS VOLUME. COVER WITH A LID, LEAVE THE LID AJAR TO ALLOW STEAM TO ESCAPE AND STIR FROM TIME TO TIME TO PREVENT BURNING. 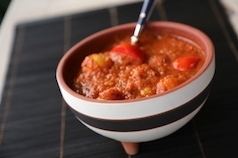 WHEN THE TOMATOES HAVE REDUCED AND THICKENED ADD POTATOES, QUARTERED TOMATOES, 200 ML COCONUT MILK, 1.5 CUPS WATER AND SIMMER ON A MEDIUM FLAME FOR 20 MINUTES. SALT TO TASTE. GARNISH WITH A GREEN CHILLIE AND SERVE HOT WITH BOILED WHITE OR BROWN RICE. THE COCHIN JEWS OF INDIA PREPARE A SEMOLINA CAKE CALLED APAM. ONE IS PREPARED WITH COCONUT, THE OTHER FOR SPECIAL OCCASIONS WITH RUM. 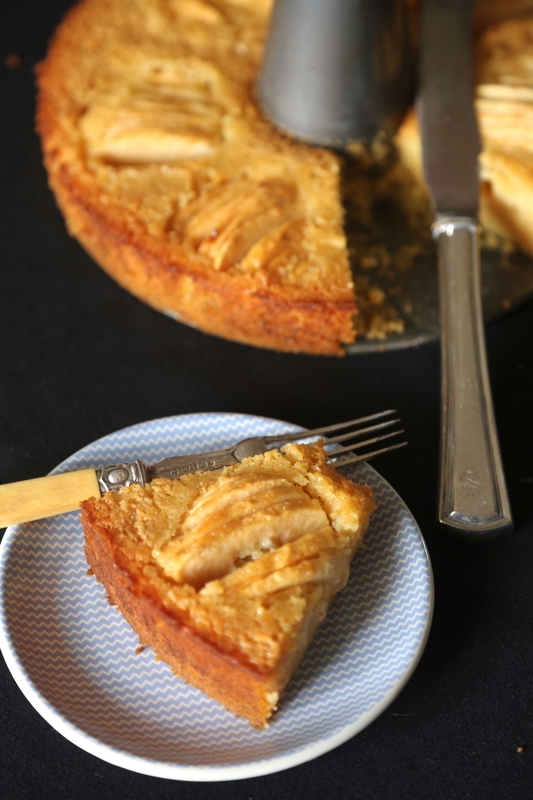 I ADD APPLES AND HONEY TO THIS CAKE FOR ROSH HASHANAH- THE JEWISH NEW YEAR. THIS IS AN EASY CAKE AND CAN BE PUT IN THE OVEN JUST BEFORE YOUR GUESTS ARRIVE SO ITS READY TO SERVE BY THE TIME DINNER IS DONE. L’SHANA TOVA! •	COMBINE ORANGE JUICE AND RUM IN A SHALLOW PAN. PEEL, CORE AND HALVE THE APPLES. AS YOU PREPARE EACH APPLE SOAK THE APPLE HALVES IN THE ORANGE JUICE AND RUM. RESERVE. •	MELT THE BUTTER IN A NON-STICK SKILLET ON A LOW FLAME. ADD THE SEMOLINA AND STIR WELL ABOUT 3 MINUTES. LET COOL COMPLETELY. •	WHEN SEMOLINA HAS COOLED STIR IN THE HONEY, EGGS, GROUND SPICE OF YOUR CHOICE AND VANILLA. •	REMOVE THE APPLES FROM THE ORANGE JUICE AND POUR THE REMAINING RUM AND ORANGE LIQUID INTO THE SEMOLINA BATTER AND WHISK WELL. •	COVER TIGHTLY AND REFRIGERATE. •	MEANWHILE PREHEAT OVEN 325F. PREPARE MIDDLE RACK. •	SLICE EACH OF THE 6 APPLE HALVES INTO SLICES. RESERVE THEM AS 6 SETS. •	REMOVE BATTER FROM THE FRIDGE AND STIR WELL. •	POUR BATTER SLOWLY INTO THE WELL-BATTERED CAKE PAN. IT IS A THICK BATTER AND YOU WILL NEED TO EASE IT INTO THE PAN USING YOUR SPATULA. SMACK THE PAN ON THE COUNTER TO SETTLE THE BATTER. •	ARRANGE THE APPLES EQUI-DISTANT FROM EACH OTHER IN THE BATTER IN SETS SO THEY ARE SPREAD EVENLY AROUND THE BATTER. PRESS DOWN GENTLY ON THE APPLES SO THEY SINK INTO THE BATTER AND SPREAD JUST A LITTLE BIT. THE BATTER SHOULDNOT COVER THE APPLES. •	PUT PAN IN THE MIDDLE RACK. PLACE ANOTHER BAKING TRAY ON THE RUNG ABOVE. THIS PREVENTS THE CAKE TOP FROM COOKING TOO FAST. •	BAKE 30-40 MINUTES UNTIL THE TOP IS GOLDEN BROWN. •	BRUSH APPLE TOPS WITH HONEY AND LET SIT ABOUT 20 MINUTES IN THE CAKE PAN AT ROOM TEMPARATURE. •	RUN A SHARP, SMALL KNIFE ALONG THE EDGES TO LOOSEN THE CAKE. INVERT IT ONCE ON TO A PLATE AND THEN AGAIN ONTO A SERVING PLATTER APPLE SIDE UP. •	IF USING A TUBE PAN SLIP THE PAN OUT FROM THE BOTTOM. •	SERVE WARM WITH ICE CREAM OR WHIPPED CREAM. CHOWDER, A NEW ENGLAND CLASSIC IS GENERALLY NON-VEGETARIAN. I EXPERIMENTED A WHILE TO MAKE ONE THATS ENTIRELY VEGETARIAN BUT HAS DEPTH AND PUNCH. I USE SOME UNUSUAL INGREDIENTS BUT THEY COME TOGETHER WELL. HEAT OIL AND BUTTER IN A LARGE SKILLET AND SAUTE RED BELL PEPPERS CHILLIES AND ONIONS UNTIL JUST SOFT. ADD GARLIC AND SAUTE 1 MINUTE. ADD CARROTS, TURMERIC AND ALL THE CORN KERNELS, WHOLE AND CHOPPED AND STIR WELL. ADD 2 CUPS OF WATER AND SIMMER. DRAIN THE PORCINI MUSHROOMS AND CHOP FINELY. RESERVE THE WATER. ADD TO THE CORN ALONG WITH THE SOAKING WATER FROM THE MUSHROOMS. 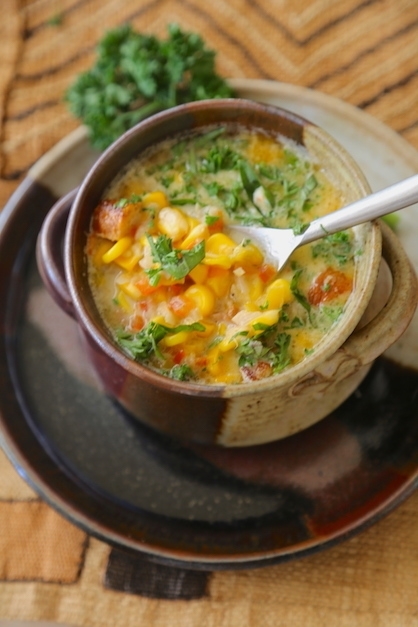 COOK UNTIL CORN IS TENDER. 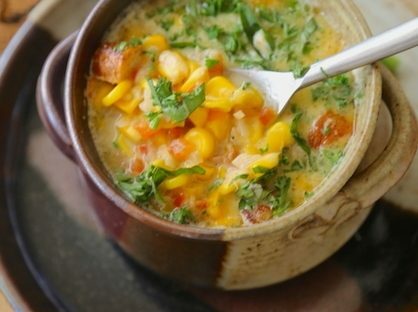 STIR IN THE MILK AND A TEASPOON OF SALT AND COOK ON A SLOW FLAME UNTIL CORN IS MELT IN YOUR MOUTH TENDER. SEASON FOR SALT AND SPICE. ADD MORE SALT OR HOT SAUCE AS PER TASTE. SERVE WITH CRACKERS OR SLICED BREAD. Preheat oven to 230 degrees. Prepare bottom rack. Add the flours, salt and oil. Mix until smooth. You can do this by hand or in a stand mixer with the dough attachment. Lightly flour a clean flat surface and turn dough out. Roll into a round circle about 1/2 inch thick. Using a large 5-6 inch doughnut cutter cut out 4-5 doughnuts. Remove the holes and reserve them. Cover with a wet cloth and let sit 30 minutes. Dust your pizza pan or rack with some fine rava or cornmeal.. 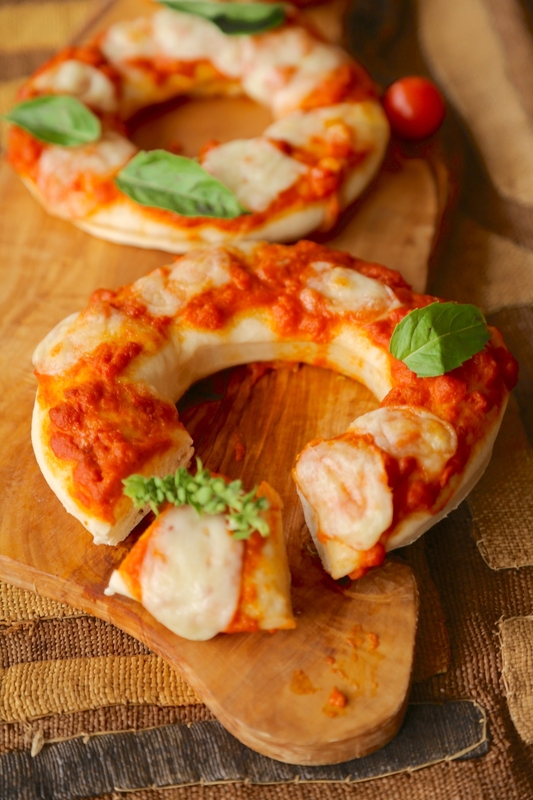 Transfer doughnuts and doughnut holes to the pan in bottom rack.Spread with pizza sauce and mozzarella and bake in preheated oven for 20 minutes, or until golden brown. Top with fresh basil leaves. Serve. It had been a long and eventful day in Srinagar. The violent skirmishes outside made us grateful to be back inside the hotel but the cold did nothing to stave off hunger pangs. By the time the waiter brought a bowl of Haak ka Saag to the table we were ravenous. Fifteen minutes later the server returns with another bowl of wilted greens. And while they did look similar, they didn't smell or taste the same. Haak Ka Saag is not made with spinach. It is neither the Mughlai Saag Paneerwala nor is it the Punjabi classic, Sarson da Saag made with mustard leaves and batua (pigweed). It’s a traditional Kashmiri dish made with not one but a variety of greens, mostly from the Acephalus family that includes cabbage, broccoli, kale and kohlrabi. Ganth gobi or Navalkole also known as Kohlrabi and Knolknol is an integral part of Kashmiri cuisine. On several American websites collard greens is recommended as a substitute for Haak. 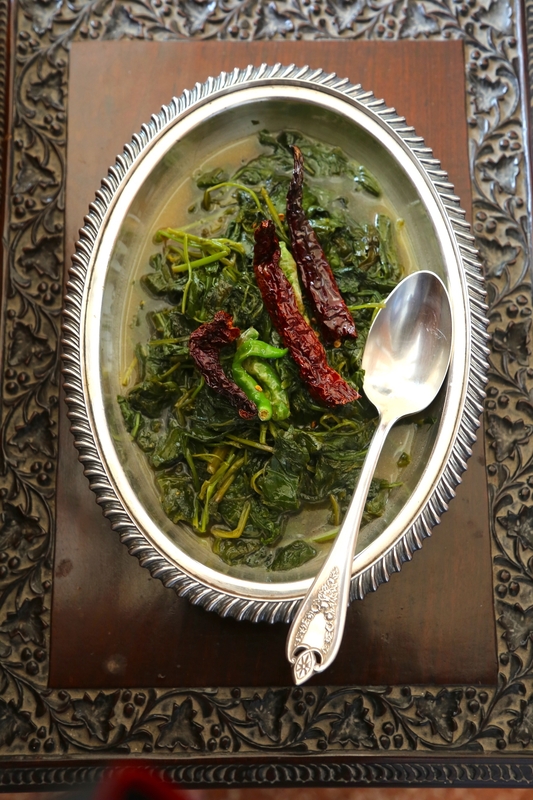 Collard greens are also from the Acephalus family but while its leaves are long and chewy and the stems thick, most of the Haak greens I saw in Srinagar were delicate and tender. Haak has not quite made it to the national table in the same way as Saag Paneer and Sarson da Saag, possibly on account of its simple flavors and the fact that it must be made and served immediately. The problem is there are various greens used in different seasons and grown in different parts of Kashmir and identifying them is not easy. This is true because Haak uses leaves from vegetables that would otherwise be discarded while cooking. Haak is a Kashmiri Pandit dish. Asafetida used to season this dish is not a spice commonly employed by Muslims. Dr. Raina recalls childhood memories of meals in his grandfather’s home just a few doors away from Chief Minister Farooq Abdullah’s house. Haak it is believed was originally cultivated by the Greeks. Interestingly, asafetida was introduced to us by their close cousins, the Macedonians. Haak and its varieties are distinguished by season and by the thickness and length of their stems called Null and leaves called Vaattir. Haak not only differs by season and Kashmir has 4 distinct weather changes but are often named after the neighborhoods they are grown in. Haak is so central to Kashmiri life that an entire vocabulary exists to describe various aspects of the dish. Kaathchie Haak is available in the Autumn. Noor bagh and Dal refer to the areas from which, the Haak could originate. The woven wicker basket specially designed for selling Haak is called Haak Foatt. A water-bed on a lake cultivating greens for Haak is referred to as Haak Raadh. Batih is Kashmiri for Pandit. Kashmiri also known as Koshur has many Perisan and Arabic borrow words but remains essentially an Indo-Aryan language close to Rigvedic Sanskrit (WIKI). Haak is eaten by everyone in Kashmiri but is a Kashmiri Pandit specialty. This recipe from Srinagar resident Amit Wanchoo’s mother, is delectable. The leaves are always cooked whole. Only very large or thick stalks may need to be trimmed or removed but traditionally the stalks are left on the leaf. The leaves must be boiled both uncovered and then in their own steam, covered for a while. Haak should be cooked and served immediately. Heat the mustard oil in a large cooking pot on medium heat. Add the asafetida and the red, dried chillies. Switch off flame. Let the spices sizzle for 1 minute. Pour in 2 cups of water and turn the flame back on. When the water reaches a furious boil add the Haak leaves and a teaspoon of salt. Let them cook open for about 3-4 minutes. Add green chillies, cover and steam another 3 minutes. Open the lid and serve the Haak immediately with boiled rice. The Sogdians of Parthia, ancient Zoroastrians were the first to cultivate apricots. The Persians called them ‘the seeds of the sun’. Bertrand Russell in In Praise of Idleness and Other Essays mentions that apricots came to India from China in the second century BC during the Kushan invasions. It was from India that the fruit travelled to central Asia. And Confucius is said to have developed his ideology meditating under an apricot tree. The Romans called the apricot ‘Armeniaca’, the tree of Armenia. In Latin, apricot is ‘Praecocia’ meaning precocious because it is the first tree to blossom after winter. Today, the fruit is a huge commercial crop in Turkey and Iran. They grow two kinds – the bitter and the sweet kernel. India is a small producer of the exquisite jardaloo, also known as Hunza, after the valley in West Pakistan where they are abundantly cultivated by the Hunzas. Fragrant apricot nuts are used commercially as almond substitutes, while the cyanide-rich seed extracts were once used in medieval England to treat ulcers and more recently, in controversial cancer drugs. 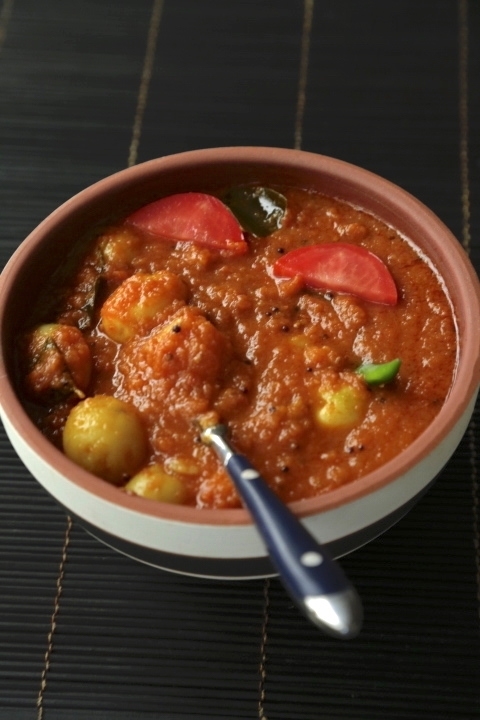 Khubani ka Meetha is a Hyderabadi specialty and is made for festive occasions. It is never served with ice cream but with malai, clotted cream or whipped cream. Some chefs add Kewra. I prefer not to. It is is one of those desserts that offer a homey comfort but is also so elegant and aromatic and rightly deserves its place in the Nizami Shahidastarkhwaan, (ceremonial meal). It is also an Indian dessert that could be served with almost any kind of food because essentially its a fruit compote with nuts. WASH THE DRIED APRICOTS THOROUGHLY. SOAK IN EXCESS WATER OVERNIGHT. WASH AGAIN, IMMERSE IN 2 INCHES OF EXCESS WATER IN A LARGE POT AND COOK ON A MEDIUM FLAME. DON'T COVER THE POT. ADD MORE WATER IF REQUIRED. COOK UNTIL FRUIT SOFTENS. SWITCH OFF FLAME AND COOL FRUIT. PEEL THE FRUIT OFF AND RETAIN THE KERNEL. RETURN THE FRUIT TO THE SAME LIQUID, ADD SUGAR AND COOK ON MEDIUM HEAT FOR 45 MINUTES, STIRRING FROM TIME TO TIME. COOK UNTIL THE FRUIT IS TOTALLY MACERATED AND PULPY. TASTE FOR SWEETNESS. ADD MORE SUGAR IF REQUIRED. WHILE THE APRICOTS ARE COOKING CRACK OPEN THE KERNELS AND REMOVE THE SMALL ALMOND LIKE NUTS INSIDE. DISCARD THE KERNELS AND RESERVE THE NUTS. STIR IN THE KEWRA IF YOU PLAN TO USE IT AFTER THE FRUIT IS FULLY COOKED. 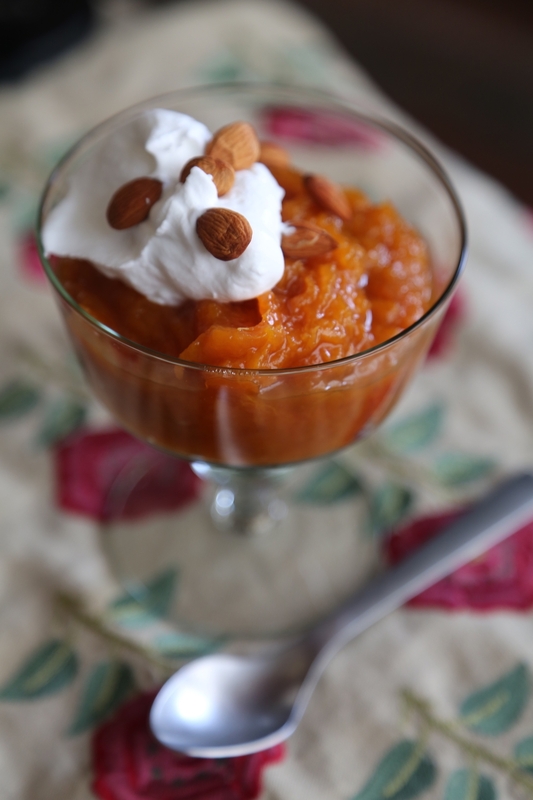 SERVE THE APRICOT COMPOTE WARM WITH CREAM AND THE APRICOT NUTS.